A whirling, chattering. 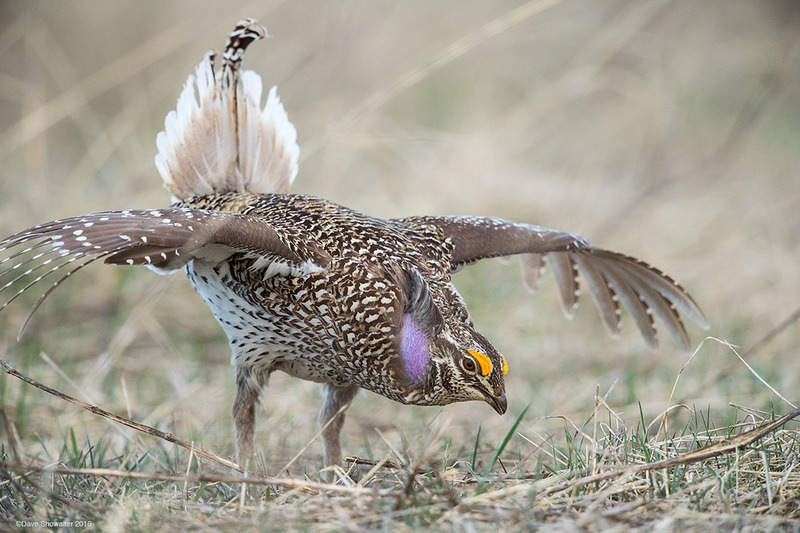 foot-stomping Columbian sharp-tailed grouse displays for a nearby female on a lek (mating ground) in northwest Colorado. The lek is mixed grass and sagebrush near a mowed grain field on private land, and the place where this population of 26 or so birds return early in the morning each spring to perform an elaborate courtship display. Described by Lewis and Clark in 1805, this smallest of sharp-tailed grouse was once the most abundant grouse species in the West. Today they occupy about 10% of their historic range and are classified as state threatened in Colorado. Photo © copyright by Dave Showalter.